SUMMARY: Intracranial DAVFs are pathologic dural-based shunts and account for 10%–15% of all intracranial arteriovenous malformations. These malformations derive their arterial supply primarily from meningeal vessels, and the venous drainage is either via dural venous sinuses or through the cortical veins. DAVFs have a reported association with dural sinus thrombosis, venous hypertension, previous craniotomy, and trauma, though many lesions are idiopathic. The diagnosis is dependent on a high level of clinical suspicion and high-resolution imaging. 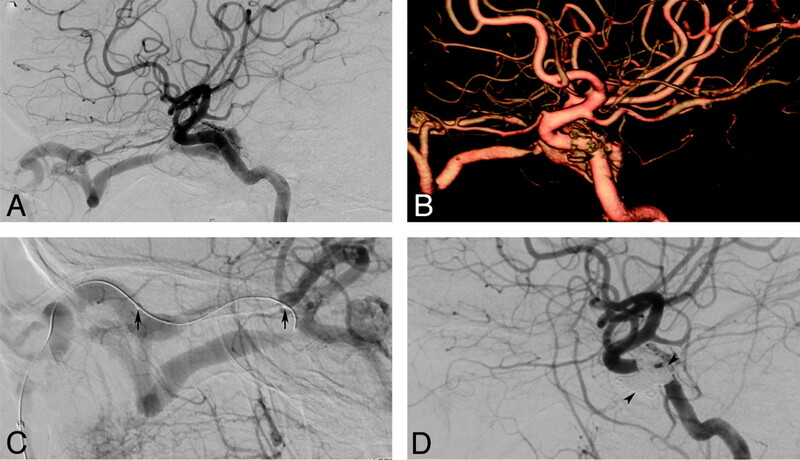 Cross-sectional imaging techniques by using CT and MR imaging aid in the diagnosis, but conventional angiography remains the most accurate method for complete characterization and classification of DAVFs. The pattern of venous drainage observed on dynamic vascular imaging determines the type of DAVF and correlates with the severity of symptoms and the risk of hemorrhage. A 53-year-old man with a history of head trauma presented with seizures and right-arm weakness. MR imaging (not shown) demonstrated bilateral parietal hemorrhage and thrombosis of the sagittal sinus. A–C, Sequential sagittal maximum intensity projections from a 320-section dynamic CTA demonstrate a subtle DAVF of the superior sagittal sinus (SSS) supplied by the anterior division of the left middle meningeal artery (arrows). Note the early opacification of the SSS. Venous phase image (C) demonstrates multiple filling defects (asterisk) in the SSS, consistent with SSS thrombosis. D–F, Correlative DSA of the left external carotid artery confirms the DAVF. The Borden classification system12 stratifies lesions on the basis of the site of venous drainage and the presence or absence of CVD (Fig 2). Borden type I lesions have the direct communication of meningeal arteries with a meningeal vein or dural venous sinus and exhibit normal antegrade flow. Type II lesions have shunts between the meningeal arteries and dural sinus, with retrograde flow into the subarachnoid veins, causing venous hypertension. Type III lesions have direct drainage of meningeal arteries into subarachnoid veins or an “isolated” sinus segment. The latter phenomenon is the result of thrombosis on either side of the arterialized sinus segment, which directs retrograde flow into the subarachnoid venous system. The Borden classification scheme further subclassifies lesions as single-hole (a) or multiple-hole (b) fistulas. Schematic overview of the Borden system of classification for DAVFs. A, Type 1 fistula with multiple communications between the occipital artery and transverse sinus. Note antegrade flow and no cortical venous reflux. B, Type 2 lesions are associated with cortical venous reflux. This illustration demonstrates the presence of a transverse sinus fistula with stenosis of the distal transverse and proximal sigmoid sinuses. There is retrograde blood flow into the proximal transverse sinus and the cortical vein (please also see Fig 1E, -F). C, Type 3 fistulas represent communication between the meningeal arteries and cortical vein (or an isolated segment of venous sinus). In this schematic drawing, the cortical vein harboring the fistula near the frontal convexity is tortuous and has multifocal stenoses in its pathway, 2011 Lydia Gregg. The Cognard classification13 is based on the direction of dural sinus drainage, the presence or absence of CVD, and venous outflow architecture (nonectatic cortical veins, ectasia cortical veins, or spinal perimedullary veins). Type I lesions drain into the dural sinus, have an antegrade flow direction, and lack CVD. Type II lesions are subdivided in 3 subcategories: type IIa lesions drain retrogradely into a dural sinus without CVD, type IIb lesions drain antegradely into a dural sinus with CVD, and type IIa + b lesions drain retrogradely into a dural sinus with CVD. Types III, IV, and V lesions all have CVD, absent dural venous drainage, and varying cortical venous outflow architecture (Tables 1 and 2). In either classification scheme, the presence of CVD (Borden type II and III, Cognard types IIb-V) is an aggressive feature that places DAVFs in a higher risk category. In these lesions, an annual mortality rate of 10.4%, an annual risk of intracranial hemorrhage of 8.1%, and annual risk of NHND of 6.9% have been reported.14 Subdividing lesions with CVD (Borden types II and III, Cognard types IIb-V) into symptomatic and asymptomatic types may further improve the accuracy of risk stratification.18 Zipfel et al18 demonstrated a significant difference in the risk of annual hemorrhage between symptomatic and asymptomatic types: 7.4% versus 1.5%, respectively. Although classifying DAVFs is helpful for risk stratification, one should be aware that these lesions have a dynamic nature. Type I lesions can develop CVD with time due to the development of venous stenosis, venous thrombosis, or increased arterial flow.19,20 The risk of conversion is low, having only been reported in 2% of low-grade lesions.19 Cases of spontaneous thrombosis/resolution of DAVFs have also been reported.21⇓⇓⇓⇓⇓–27 Any change in a patient's symptoms can reflect exacerbations of the venous drainage pattern and prompt further imaging work-up. Severe presentations include intracranial hemorrhage and nonhemorrhagic neurologic deficits such as seizures, parkinsonism, cerebellar symptoms, apathy, failure to thrive, and cranial nerve abnormalities, including rare cases of trigeminal neuralgia.28⇓⇓⇓⇓–33 Some symptoms, including dementia and cognitive decline, may improve after treatment.34 Hemorrhagic presentations are more frequent in high-grade (Borden types II and III, Cognard types IIb to IV) DAVFs. Unexplained subarachnoid or lobar hemorrhages should prompt consideration of a DAVF in the differential diagnosis. Initial radiologic evaluation includes CT and MR imaging. Noncontrast CT is limited to identifying intracranial hemorrhage and edema due to venous congestion. MR imaging is more helpful because it can demonstrate dilated vessels, venous pouches, vascular enhancement, and signs of venous hypertension in high-grade lesions (eg, white matter hyperintensity, intracranial hemorrhage, or venous infarction). These findings, however, vary with the type of DAVF investigated. Type I and II lesions may reveal flow-void clustering, engorged ophthalmic veins, or proptosis, whereas aggressive type II or III lesions are more likely to show dilated vessels, prominent vascular enhancement,1 and hemorrhage. Endovascular approaches have become the mainstay of DAVF therapy, but the optimal approach for each case should involve discussions among a multidisciplinary team of interventional neuroradiologists, neurosurgeons, neurologists, and radiation oncologists. Careful assessment of a patient's clinical presentation, current status (age, medical condition, comorbidities), and type of lesion (location, classification, and angiographic features) should be conducted before embarking on any treatment. The risk of treatment should always be weighed against the natural history and expected clinical course of the lesion. High-grade lesions should be treated early to avoid the risks of hemorrhage and NHND. Conservative treatment is generally indicated in patients with low-grade fistulas (Borden I; Cognard I, IIa). Close follow-up is necessary to assess the development of new symptoms or progression of existing ones. Low-grade lesions with severe debilitating symptoms (eg, severe tinnitus or visual symptoms resulting in poor quality of life) are, however, candidates for prompt endovascular repair. The optimal method of endovascular treatment remains debated and controversial. A consideration of the advantages and disadvantages of transarterial, transvenous, and combined approaches should be given in each case before proceeding with embolization. A 52-year-old man presented with severe headache, slurred speech, and acute left hemiparesis. A, Noncontrast CT reveals a large right frontoparietal hematoma with intraventricular extension. B–D, A DAVF was suspected on MR imaging (not shown), and DSA was performed. Right (B), left (C), and bilateral (D) external carotid artery injections confirm a convexity DAVF (Borden type 3) with arterial supply from the bilateral middle meningeal and superficial temporal arteries. Transarterial treatment was planned by using the right middle meningeal artery approach (D). A microcatheter was navigated close to the fistula, and the embolization was performed with 2.3 mL of Onyx (E). Note the penetration of Onyx into the arteriovenous junction and the proximal vein (asterisk) as well as arterioarterial reflux (arrows) into the contralateral feeders. F, Ipsilateral (not shown) and contralateral external carotid artery injections confirm complete occlusion of the fistula. The patient made a remarkable recovery during the next 3 months and has mild residual left-arm weakness. TAE involves superselective distal catheterization of arterial feeders. Ideally, the microcatheter tip should be “wedged” in the feeding artery and the embolic agent should penetrate the fistulous connection and proximal aspect of the venous receptacle.47⇓–49 Available embolic agents include particles, coils, ethanol, n-BCA glue, and Onyx (ev3, Irvine, California).41,45,47,49 Particles should generally be avoided because complete durable fistula obliteration is usually impossible, allowing subsequent recanalization from collateral recruitment.42,47 Coils can be used as an adjunct to liquid embolic agents to reduce the rate of shunt surgery in high-flow lesions but are not usually curative when used alone. The use of Onyx has been increasingly reported for the treatment of DAVFs.41,45,48 This nonadhesive embolic agent consists of ethylene-vinyl alcohol copolymer dissolved in various concentrations of DMSO with micronized tantalum powder for radiopacity. On contact with blood, DMSO rapidly diffuses from the mixture, causing in situ precipitation of the polymer without adhesion to the vascular wall. The polymer initially precipitates within the peripheral area of the blood vessel, with secondary occlusion of the central vessel. This allows a longer more controlled injection with better penetration of the vascular bed compared with n-BCA.51 The operator also has the option of stopping the injection if Onyx begins to track toward another arterial pedicle, venous outflow vessel, or suspected dangerous anastomoses. The injection can then be restarted after several seconds because Onyx will track toward the low-pressure environment of the residual fistula. Another technical advantage of Onyx is the possibility of obtaining control angiograms during the embolization. This allows assessment of the remaining fistula flow and the changing hemodynamic pattern of a complex lesion. A major advantage of Onyx is the ability to cure complex multifeeder fistulas via a single pedicle (Fig 3).49 Excellent cure rates have been reported with this agent, with a high proportion of treatments completed in a single session.41,45,52 In a series of 30 patients with DAVFs with CVR, Cognard et al45 achieved a complete cure in 24 patients. Of these 24 patients, 20 cures were achieved after a single procedure. The use of Onyx is associated with some disadvantages as well. Prolonged fluoroscopic times can occur, and careful attention must be paid to avoid radiation-induced injury.41,52 Other reported events including catheter entrapment, angiotoxicity from DMSO, and cranial nerve injury.41,46 Many of these complications can be prevented if the operators recognize their potential mechanisms. DMSO-induced angiotoxicity and vasospasm can be prevented by slow Onyx injection.41 Similarly, catheter retention can be avoided by limiting reflux around the catheter tip and positioning the catheter tip in a relatively straight vessel segment. We avoid Onyx injection into vessels known to supply the lower cranial nerves (petrosal branch of the middle meningeal artery, stylomastoid branch of the posterior auricular and occipital arteries, and jugular branch of the ascending pharyngeal artery). Under these circumstances, alternative suitable vessels for embolization can usually be found. If adequate penetration into the fistula is achieved, the remaining feeders will thrombose spontaneously. 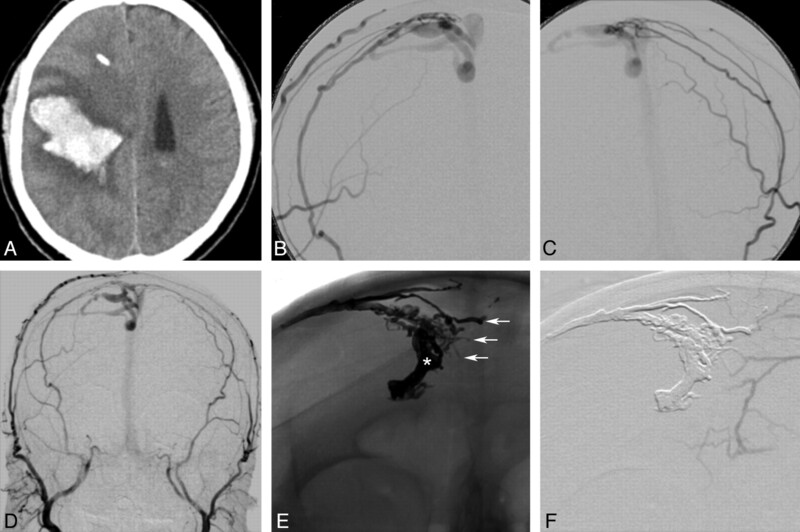 TVE is performed by retrograde catheterization of the involved dural sinus or cortical vein followed by deposition of coils and/or liquid embolic agents adjacent to the shunt. The aim of this treatment is occlusion of the arteriovenous fistula and/or disconnection of leptomeningeal or cortical reflux with preservation of normal venous drainage. TVE is more safely used when the diseased sinus segment has minimal contributions to normal venous outflow and can be completely occluded. More caution is required when the dural venous sinus maintains drainage of normal veins—in these circumstances, precise identification of the fistula is essential to avoid potential venous infarction or hemorrhage. Partial embolization of the involved dural sinus should be avoided because the diversion of shunt flow into the normal cerebral venous pathways can lead to worsening CVD. 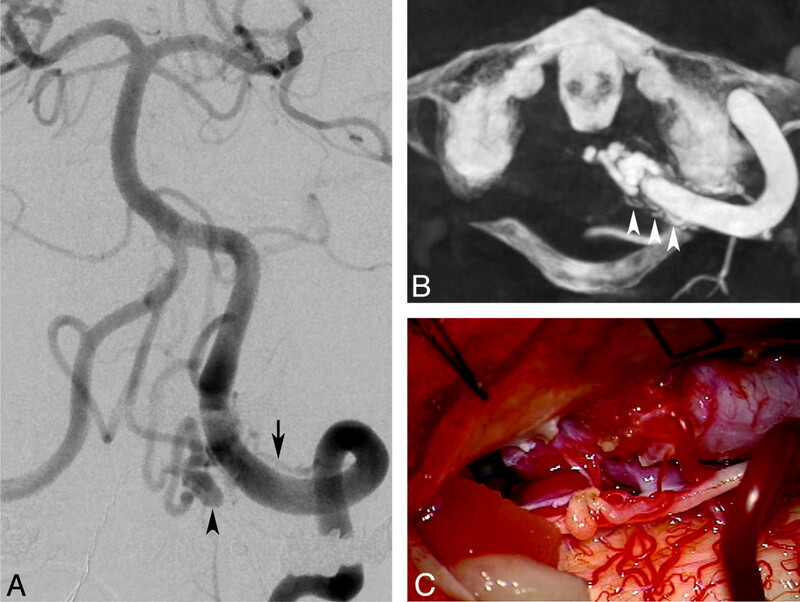 A 43-year-old woman with Factor V Leiden mutation developed a spontaneous left-sided dural type (indirect) carotid cavernous fistula (CCF) with proptosis, chemosis, and left cranial nerve VI paralysis. A and B, Lateral view of the left internal carotid artery (ICA) injection and a left ICA 3D reconstruction demonstrates a moderate-flow CCF supplied from multiple left cavernous ICA branches. Additional supply also originated from left external carotid artery (ECA) and right ECA branches (not shown). Given the small size and multiplicity of feeders, transvenous treatment was favored. C and D, A microcatheter was navigated from the left facial vein into the left superior ophthalmic vein (arrows). The cavernous sinus was filled with coils (arrowhead), resulting in complete obliteration of the fistula (D). The proptosis and chemosis resolved the same day, and improvement of left cranial nerve VI function was already evident on postoperative day 1. The risks of TVE include vessel perforation, infarction, intracranial hemorrhage, and transient or permanent neurologic deficits related to changes in venous drainage course.55,56 Transient ophthalmoplegia has been reported in 14% of cavernous sinus embolizations,55 but patients typically have a full recovery. The risk of cranial nerve damage from coil mass effect or direct coil injury can be avoided through the use of liquid embolic agents. Permanent complications have been reported in 4%–7% of cases.53⇓–55 Despite these risks, TVE can be a safe and effective procedure for many DAVFs and can be used as an adjunct to TAE for a complete cure. Due to the efficacy of endovascular treatment, surgery is currently indicated in cases in which endovascular approaches have failed or are not feasible. 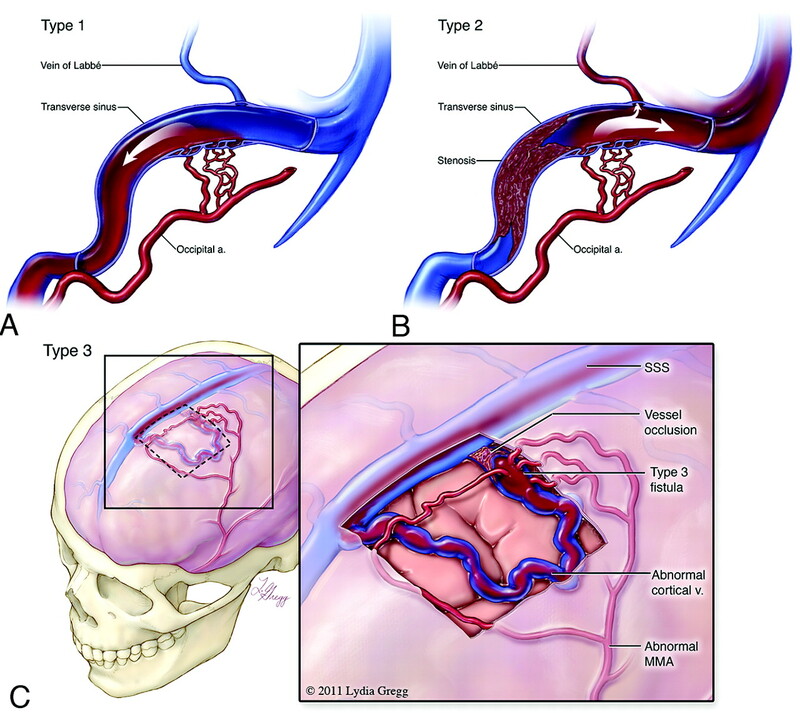 A variety of options is available, including direct intraoperative embolization of meningeal arteries or veins, resection of abnormal dura, packing of the diseased sinus, disconnection of the retrograde leptomeningeal venous drainage, and skeletonization of the dural sinus with disconnection of the dural arterial supply (Fig 5). Certain anatomic locations of DAVFs are more amenable for surgery. These include the floor of the anterior cranial fossa and the superior sagittal sinus, where arterial access is difficult and/or sacrifice of the sinus is often undesirable.57,58 DAVFs that involve eloquent feeders are also better addressed by using a surgical or combined approach to ensure vessel preservation. A 58-year-old male patient presented with thunderclap headache and a small subarachnoid hemorrhage centered at the foramen magnum. A, Left vertebral angiogram demonstrates a dural fistula at the foramen magnum adjacent to the V4 segment of the left vertebral artery. A dominant feeder is noted arising from the left vertebral artery (arrow), and there is a focal venous varix (arrowhead). The venous drainage was along the perimesencephalic vein into the left superior petrosal sinus (not shown). B, Axial DynaCT (Siemens, Erlangen, Germany) reconstruction reveals multiple additional feeders (arrows) that were difficult to appreciate on 2D DSA. The patient underwent an embolization of the larger feeder transarterially, but complete occlusion of the fistula was not accomplished. C, The residual fistula was surgically occluded. A partial C1 laminectomy and suboccipital craniotomy were fashioned. Surgical disconnection of the venous outflow was performed, resulting in complete obliteration of the fistula. The patient made an uncomplicated and complete recovery. Studies of SRS for DAVFs remain preliminary and have primarily involved low-risk lesions or those that are not amenable to endovascular or surgical approaches. Lesions are irradiated with 20–30 Gy, which causes vessel thrombosis and fistula closure during a latency period ranging from several months to a year. Until completion of vessel thrombosis, the hemorrhage risk remains elevated,61 so SRS is inappropriate as the primary treatment in DAVFs with CVD. Early results have been encouraging, with obliteration rates as high as 93% for combined endovascular embolization and SRS62 but have also demonstrated rates as low as 50% when only SRS is used.63 There have also been significant disparities in efficacy depending on the location of the fistula,64 reflecting challenges for shunt targeting in complex lesions. Experience with SRS currently remains limited, and this technique should be reserved for carefully selected DAVFs for which endovascular and surgical options have been exhausted. A number of classification schemes have been devised to aid in the clinical management of DAVFs. The Borden classification stratifies the lesions into 3 types according to the venous drainage pattern (dural venous sinus [types I and II] versus cortical vein [type III] and the presence [types II and III] of cortical venous reflux. These classifications are useful for categorizing lesions as benign or aggressive, but they do not consider the natural history of these lesions. DAVFs are dynamic lesions that may either spontaneously regress or progress, so close attention to any change in symptoms is important because this may signify a change in the type of venous drainage pattern. Additionally, further subdivision of the DAVFs with CVD into symptomatic and asymptomatic lesions may help stratify high-risk patients and modify treatment planning in the future. Noninvasive imaging evaluation by CTA and MRA can provide useful information for diagnosis, classification, and treatment planning, but the criterion standard for DAVF imaging remains DSA, particularly with the new adjunct of conebeam CT. Treatment should be pursued for all DAVFs with CVD or intolerable symptoms, and management decisions should be approached by a multidisciplinary team that is capable of evaluating all possible therapies. We thank Lydia Gregg, Medical Illustrator and Research Associate, Division of Interventional Neuroradiology, Johns Hopkins School of Medicine, for her contribution with Fig 2. Disclosures: Dheeraj Gandhi—UNRELATED: Consultancy: Covidian, ev3; Grants/Grants Pending: Merlin, aneurysm occlusion device; Other: occasional medicolegal case review with no relevance to this work. James Chen—UNRELATED: Other: Doris Duke Charitable Foundation, Comments: Doris Duke Clinical Research Fellowship. Judy Huang—UNRELATED: Royalties: Thieme Medical Publishers, Comments: Fundamentals of Operative Neurosurgery. 2nd ed. Sudhir Kathurai—UNRELATED: Grant/Grants Pending: Siemens.